We installed vehicle graphics on your vehicle and we want to help you take care of it with some helpful tips. 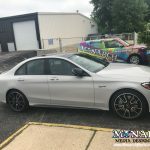 For Color Change Wraps, and any other 3m 1080 Vehicle striping or Accents, click here to read the "3M 1080 Color Change Graphic After-Care" article. For our vehicle graphics, we only use top name brand inks and printing equipment and materials. Now that you have transformed your vehicle with some awesome graphics, here are a few things to keep in mind now that you are out on the road with your vehicle. 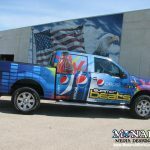 You can expect that your vehicle graphics will last a minimum of 3-5 years (4-6 years for partial/full wraps using Premium or “Super” Vinyl). 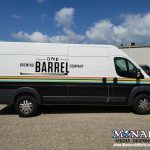 This means that it will be an effective rolling billboard during this time period without abnormal image fading, discoloration, cracking or peeling. The vinyl will adhere to the vehicle’s surface and will be removable using heat. Small edges or serif (curvy, pointed) fonts may have small sensitive areas to watch. Specialty vinyl such as chrome, metallic, and reflective, should be watched as they are not designed for long-term outdoor use. We use an intermediate-grade 3M Vinyl for printed & cut logos, and they are also laminated prior to cutting with a 3M matching laminate design especially for vehicle applications to protect from scratching. Our partial / full wraps are produced using “best-in-industry” 3M Vinyl to conform to curves & complex areas. Additionally, our products carry a 3M lamination layer that further protects the vinyl. This helps to protect against the elements, as well as door dings, minor scratching, and salt buildup/damage. 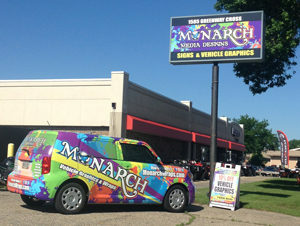 We use only 3M 1080 vinyl when it comes to color change wraps. A premium choice in the industry to give you 4-6 years of coverage. Minor dings and scratches can be repaired easily with a patch of color. The vinyl that is applied to the window is called perforated window vinyl. Window graphic printing has a faded effect to begin with, so look for peeling (as opposed to discoloration) around the edges to determine when to replace them. This is not covered under warranty, so there will be a charge to replace the graphics every 1-3 years. Weather is a big factor. Roof graphics may have a shorter time period before fading/discoloration due to intense contact with the sun. Can I wash the graphics? We recommend waiting at least one to two weeks prior to washing your vehicle. The graphics, especially partial and full wraps, actually protect your vehicle from the elements, and proper care of your wrap will ensure this success. Do not pressure-wash or wax over your vehicle graphics. Over time, it can degrade the face film causing the graphics to lose its luster, fade, crack and even chip away from the substrate. The best way to wash your vehicle is by hand with a soft, non-abrasive cloth using a mild (solvent and alcohol free) cleaner and, after a complete rinse, let the vehicle air dry, or dry with non-scratching towel. The next best method would be going through a commercial “touch free” car wash. This doesn’t mean that it has to be completely touch-free, just avoid any establishments that use excessive pressure in their sprays, or harsh brushes, etc. that can chip away at your graphics. What if I see bubbles? Bubbles are more common when using intermediate grade vinyl but can appear during most applications. They will disappear after 1-2 weeks of “baking out” in the sun. If you are concerned about any bubbles in your graphics after 2 weeks, give us a call for your After Care Checkup appointment and we will take care of it. Bubbles are popped by using a pin or other pointy object, and smoothed out with your finger. Why are some areas not wrapped? Our 3M certified installers are trained to trim along areas that they consider “hazardous” to the wrap, so if your vehicle has a lot of complex areas, they may have to be strategically trimmed. Certain vehicles are not necessarily wrap-friendly, but we do our absolute best to install for longevity. Will it withstand extreme temperatures? Vehicle graphics are often applied using heat, so high temperatures do not affect the quality of the wrap. For snow removal, only use a soft brush or squeegee. Never use a scraper, as this will damage the vinyl. In situations like this, we can reprint damaged areas. We can replace a component of the wrap, called a “panel”. 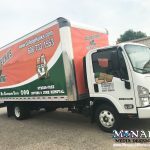 If the damage is great, we may recommend that entire side or rear of the vehicle wrap be replaced to provide a good color match, and to keep your rolling billboard looking good. During the life of the graphics, you may experience some minor lifting of the vinyl in certain areas. Do not worry! If you are comfortable doing so, you can trim off problem areas using an Exacto blade, or give us a call and we’ll take care of it. Should your vehicle graphics become damaged, we can assist you in obtaining replacement graphics. Since our warranty does not cover these items, there will be a charge for the replacement items. Talk to your insurance company about a plan to cover your investment. Yes. The graphics come off easily with heat. The high-quality materials we use allow for less labor-intensive removal than with using low or standard grade materials. They are also designed to be removed without harming the paint. Weather conditions and overall care & condition can vary per vehicle so we do not offer an in-house warranty. We definitely stand by our work and our materials, though. 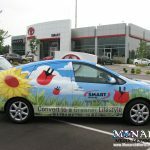 We only use 3M materials for vehicle graphics & wraps, and 3M offer a One-Year Limited Warranty that covers installation issues and material defects only. Even after your wrap has been on for a while, we can easily repair, upgrade, change information (phone number, website, etc. ), or rewrap parts of the vehicle at a reasonable rate. Some peeling and cracking may eventually occur in extremely curvy/complex areas, tight corners, and pointed areas. This is normal, especially with vehicles that are subject to extremely cold temperatures in the Midwest. Vehicles that are kept directly in the sun may experience faster than normal color fading. Perforated vinyl may need to be replaced every 1-3 years due to wear and tear. It is ok to use heating/defrosting elements, but use caution using your rear wiper, and/or rolling windows up and down. Excessive use of these items can limit the life of your graphics. We can laminate the material to help with longevity. Rearview mirrors, hinges, anything plastic, or other custom wrapped items are not covered under warranty due to the fact that they are installed on complex curves that are not guaranteed to hold up under extreme conditions. Peeling paint may occur during removal if the vehicle is involved in an accident and causes paint to chip beneath the vinyl surface, or if the paint beneath the vinyl was not properly treated & coated. Paint issues are not covered under our one-year warranty.